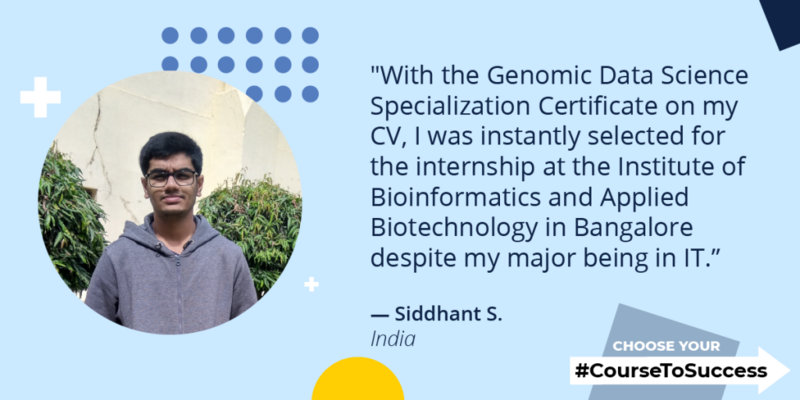 Siddhant is an avid learner on Coursera who found his #CourseToSuccess in data science with the Genomic Data Science and Bioinformatics Specializations. He’s studying in a dual degree program in Information Technology at the Indian Institute of Information Technology in Gwalior, India. I was introduced to Coursera by my older brother, who was doing his undergrad in Aerospace Engineering at the time. I was a freshman at my college starting out with introductory level courses in engineering, mathematics, physics, and computer science. I told him I wanted to learn to how to program in Python. He suggested to look for those courses on Coursera and to look into the field of data science and machine learning since they are important growth areas. The first course that I enrolled in was Programming for Everybody (Getting Started With Python) from the University of Michigan. The content was simply outstanding — the lecture videos and programming assignments covered the material in breadth as well as depth. I became hooked on Coursera, and took one course after another. After I learned Python, I took computer science courses like Automata and Algorithms: Design and Analysis with Stanford. Next, I moved over to machine learning and data science courses. Before college, I was interested in understanding how to use computational methods to solve biological problems. I decided to explore topics like bioinformatics and genomic data science. The Bioinformatics Specialization by UC San Diego is an excellent program that covers algorithmic ways to solve biological problems. The Genomic Data Science Specialization by John Hopkins focused on the use of tools and pipelines to analyze biological data and make inferences, which I found very interesting. After I was done with the two Specializations, I applied to a summer internship program at the Institute of Bioinformatics and Applied Biotechnology (IBAB) in Bangalore in 2016. With the Genomic Data Science Specialization certificate mentioned on my CV, I was instantly selected for the position despite having majored in IT. At IBAB, I worked to establish a pipeline for data cleaning to support cross-experiment microarray data analysis. I learned about this through one of my Specializations and it was great to apply that knowledge to my internship work. I am now at the top of my cohort in the institute, thanks to my computer science knowledge. I’m well-informed of the latest research that is going on in the field of deep learning. All this is possible thanks to what I learned through Coursera. Best of all, I earned two summer internships and a job offer for a data scientist role solely on the basis of my Coursera certificates. My courses on Coursera helped me decide to work towards becoming an AI researcher. I plan to continue taking courses and to apply for a PhD program, where I’ll research the latest deep learning models and their application in Natural Language Processing.